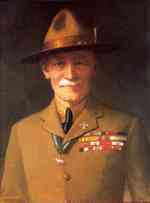 LORD BADEN STEVENSON SMYTH BADEN POWELL WAS BORN IN LONDON, ENGLAND ON FEBRUARY 22, 1857- THE DAY ON WHICH THE AMERICANS CELEBRATED THE 125th BIRTHDAY OF GEORGE WASHINGTON. HIS FATHER WAS THE REVERNED H.G BADEN POWELL, PROFESSOR AT OXFORD.HIS MOTHER WAS THE DAUGHTER OF THE BRITISH ADMIRALW.T.SMYTH.HIS FATHER DIED WHEN HE WAS THREE,LEAVING HIS MOTHER WITH SEVEN CHILDREN UNDER FOURTEEN YEARS OF AGE. INSPITE OF HIS FAMILY PROBLEMS HE LIVED AQ GLOURIOUS WITH HIS BROTHERS ,HIKING & CAMPING WITYH THE IN MANY PARTS OF ENGLAND. IN 1870, BP ENTERED CHARTER HOUSE SCHOOLIN LONDON ON A SCHOLARSHIP. AT 19, IN 1876, BP GRADUATED FROM CHARTER HOSE SCHOOL & IMMEDIATELY ACCEPTEDA CHANCE A GO TO INDIA AS A SUBLIEUTENANT, TO JOIN THE REGIMENT WHICH HAD FORMED THE RIGHT OF THE CAVARLY LINE IN THE FAMOUS "CHARGE OF THE LIGHT BRIGADE" IN THE CRIMEAN WAR. IN 1887,BP TOOK PART IN THE CAMPAIGN AGAINST THE ZULUS, &LATER AGAINST THE FIERCE TRIBES OF ASHANTI & MATABELE WARRIORS.THE NATIVE FIERCED HIM SO MUCH THATTHEY GAVE HIM THE NAME "IMPESSA- THE WOLF THAT NEVER SLEEPS", BECAUSE OF HIS SCOUTING SKILLS & TRACKING ABILITES.THE OTHER NAMES BY WHICH BP WAS CALLED WERE "MHALA PANZI - THE MAN WHO LIES DOWN TO SHOOT" & "KANTYANKYE - HE WITH THE BIG HAT". IN 1899 BP WAS RISEN TO THE POST OF 'COLONEL'. WAR CAME & 217 DAYS FROM OCTOBER 13, 1899- BP HELD MAFEKINGIN THE SIEGE AGAINST OVERWHELMINGNUMOARS OF ENEMY, UNTIL RELIEF FORCE FINALLY FOUGHT THEIR WAYTO HELP ON 18th DAY OF MAY 1900. BP WAS NOW RAISED TO THE POST MAJOR GENERAL,FOUND HIMSELF A HERO IN THE EYES OF HIS COUNTRYMEN. IT WAS A HERO OF MEN & BOY RETURNEDTO ENGLAND FROM SOUTH AFRICA IN 1901. HIS HIS PERSONAL POPULARITY HAD GIVEN POPULARITY TO BOOK FOR ARMYMEN- "AIDS TO SCOUTING".IT WAS BEIGN USED AS A TEXT IN BOYS SCHOOL.BP WANTED TO MAKE SURE THAT HIS IDEAS WOULD WORK,SO IN SUMMER OF 1907, HE BEGAN TO ACCUMULATE A FEW BOYS FROM THE BOYS BRIGADE & FRIENDS & TOOK THEM TO " BROWN SEA ISLAND" IN THE ENGLISH CHANNEL.THIS WAS THE FIRST SCOUT CAMP THE WORLD HAD EVER SEEN. IN THE EARLY MONTHS OF 1908, HE BROUGHT OUT IN SIX FORTNIGHTLY PARTS,ILLUSTRATED BYHIMSELF, HIS HANDBOOK FOR TRAINING, "SCOUTING FOR BOYS"WITHOUT THAT THIS BOOK WOULD SET IN MOTION, A MOVEMENTWHICH WAS TO AFFECT THE BOYHOOD OF THE ENTIRE WORLD. THE MOVEMENT GREW & GREW& HAD IN 1920REACHED SUCH PROPORTION THAT BP REALISED THAT SCOUTING WAS TO BE HIS LIFE JOB.SO HE RECOGNISED HIS TROOP & RAECOGNISED FROM THE ARMY TO DEVOTE HIMSELF TO SCOUTING. IN 1909 A RALLY FOR SCOUTS WAS HELD AT "CRYSTAL PALACE".AMONG THE BOY SCOUTS BP SAW A GROUP OF GIRLS WHO HAD SNEAKED INTO THE RALLY DRESSED AS SCOUTS.HOWEVER THEY WERE FIRST REFUSED BY BP AS HE FELT THAT THE GAME WAS NOT FOR GIRLS. THE GIRLS TOO WERE DETERMINED& BP RECIEVED NEARLY ASKING HIM TO DO SOMETHING FOR GIRLS.SO MISS AGNES BADEN POWELL WROTE A BOOK CALLED "HOW GIRLS CAN HELP THE EMPIRE". IN 1914 CUBBING WAS STARTED. 1912 BP SET OUT ON A TRIP AROUND THE WORLD TO MEET THE SCOUTS IN MANY COUNTRIES.IN1920, SFROM ALL PERT OF THE WORLD MET IN LONDON FOR THE 1st WORLD JAMBOREE AT "OLYMPIA IN LONDON". ON THE LAST NIGHT OF THE JAMBOREE ,ON AUGUST 6th BP WAS PROCLAIMED AS THE "CHIEF SCOUT OF THE WORLD".THERE AFTER OTHER OTHER JAMBOREES WERE HELD AT DIFFERENT PLACES OF THE WORLD. AT EACH OF THEIS JAMBOREE BP WAS THE MAIN FIGURE.